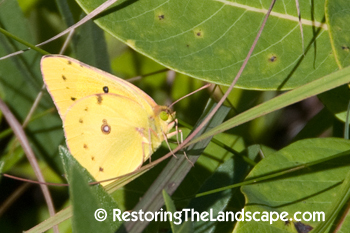 A first sighting of the Orange Sulphur butterfly was in our yard last week. Another tattered female gliding over the prairie plants looking for host plants to lay her eggs upon. I watched with curiosity what she would choose as these butterflies are host plant generalists - liking most plants falling in the Legume or Pea family (Fabaceae). 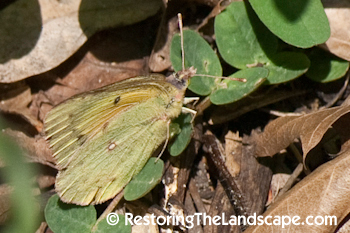 The female laid eggs on two native perennials in our yard, the first - tiny seedlings of White Wild Indigo (Baptisia alba). 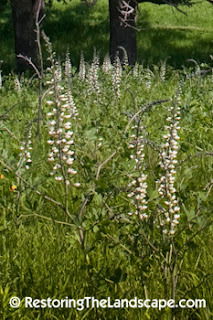 Wild White Indigo has an open branching habit with gray-green palmately divided leaflets. It can grow from 3 - 6 feet in height depending on moisture and soil conditions. 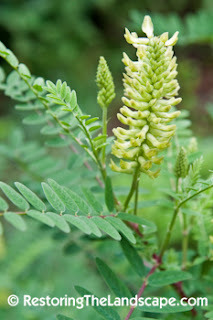 The other host plant of choice was Canada Milk Vetch seedlings (Astragalus canadensis). 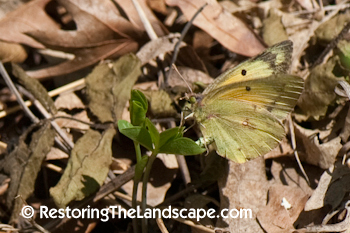 Both of these host plants are good candidates for sandy to loamy soils in full to partial sun. Canada Milk Vetch is also a tall perennial growing up to 4 feet in height. The red stems and many leaflets make it a nice contrasting textured plant next to prairie grasses and larger leaved natives.